OGA, Japan -- The Japanese have long taken an easygoing, buffetlike approach to religion, ringing out the old year at Buddhist temples and welcoming the new year, several hours later, at Shinto shrines. Weddings hew to Shinto rituals or, just as easily, to Christian ones. When it comes to funerals, though, the Japanese have traditionally been inflexibly Buddhist - so much so that Buddhism in Japan is often called “funeral Buddhism,” a reference to the religion’s former near-monopoly on the elaborate, and lucrative, ceremonies surrounding deaths and memorial services. But that expression also describes a religion that, by appearing to cater more to the needs of the dead than to those of the living, is losing its standing in Japanese society. Mr. Mori, 48, the 21st head priest of the temple, was unsure whether it would survive into the tenure of a 22nd. Here in Oga, on a peninsula of the same name that faces the Sea of Japan in Akita Prefecture, Buddhist priests are looking at the cold math of a population and local fishing industry in decline. “It’s not an exaggeration to say that the population is about half of what it was at its peak and that all businesses have also been reduced by half,” said Giju Sakamoto, 74, the 91st head priest of Akita’s oldest temple, Chorakuji, which was founded around the year 860. “Given that reality, simply insisting that we’re a religion and have a long history — Akita’s longest, in fact — sounds like a fairy tale. It’s meaningless. “That’s why I think this place is beyond hope,” Mr. Sakamoto said at his temple, which sits atop a promontory overlooking a seaside village. To survive, Mr. Sakamoto has put his energies into managing a nursing home and a new temple in a growing suburb of Akita City. That temple, however, has drawn only 60 households as members since it opened a couple of years ago, far short of the 300 said to be necessary for a temple to remain financially viable. For centuries, the average Buddhist temple, whose stewardship was handed down from father to eldest son, served a fixed membership, rarely, if ever, proselytizing. With some 300 households to cater to, the temple’s chief priest and his wife were kept fully occupied. Not only has the number of temples in Japan been dipping — to 85,994 in 2006, from 86,586 in 2000, according to the Japanese Agency for Cultural Affairs — but membership at many temples has fallen. “We have to find other jobs because the temple alone is not enough,” said Kyo Kon, 73, the head priest’s wife at Kogakuin, a temple here with 170 members. She used to work at a day care center while her husband was employed at a local land planning office. Not far away at Doshoji, a temple whose membership has fallen to 85 elderly households, the chief priest, Jokan Takahashi, 59, was facing a problem familiar to most small family-run businesses in Japan: finding a successor. His eldest son had undergone the training to become a Buddhist priest, but Mr. Takahashi was ambivalent about asking him to take over the temple. “My son grew up knowing nothing but this world of the temple, and he told me he did not feel free,” he said, explaining that his son, now 28, was working at a company in a nearby city. “He asked me to let him be free as long as I was working, and said that he would come back and take over by the time he turned 35. “But considering the future, pressuring a young person to take over a temple like this might be cruel,” Mr. Takahashi said, after giving visitors a tour of his temple’s most important room, an inner chamber with wooden, lockerlike cabinets where, it is said, the spirits of his members’ ancestors are kept. On a recent morning, Mr. Mori, the priest of the 700-year-old temple, began the day with a visit to a rice farming household marking the 33rd anniversary of a grandfather’s death. Bowing before the home altar, Mr. Mori prayed and chanted sutras. Later, he repeated the rituals at another household, which was commemorating the seventh anniversary of a grandfather’s death. Increasingly, many Japanese, especially those in urban areas, have eschewed those traditions. Many no longer belong to temples and rely instead on funeral homes when their relatives die. 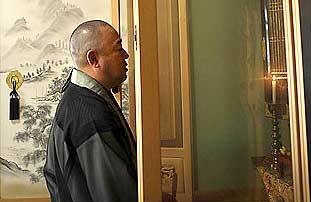 The funeral homes provide Buddhist priests for funerals. According to a 2007 report by the Japan Consumers’ Association, the average cost of a funeral, excluding the cemetery plot, was $21,500, of which $5,100 covered services performed by a Buddhist priest. As recently as the mid-1980s, almost all Japanese held funerals at home or in temples, with the local Buddhist priest playing a prominent role. But the move to funeral homes has sharply accelerated in the last decade. In 1999, 62 percent still held funerals at home or in temples, while 30 percent chose funeral homes, according to the Consumers’ Association. But in 2007, the preferences were reversed, with 28 percent selecting funerals at home or in temples, and 61 percent opting for funeral homes. In addition, an increasing number of Japanese are deciding to have their loved ones cremated without any funeral at all, said Noriyuki Ueda, an anthropologist at the Tokyo Institute of Technology and an expert on Buddhism. “Because of that, Buddhist priests and temples will no longer be involved in funerals,” Mr. Ueda said. He said Japanese Buddhism had been sapped of its spiritual side in great part because it had compromised itself during World War II through its close ties with Japan’s military. After Buddhist priests had glorified fallen soldiers and given them special posthumous Buddhist names, talk of pacifism sounded hollow. Mr. Mori, the priest here, said that after the war there was a desire for increasingly lavish funerals with prestigious Buddhist names. These names — with the highest ranks traditionally given to those who have led honorable lives — are routinely purchased now, regardless of a dead person’s conduct in life. “Soldiers, who gave their lives for the country, were given special posthumous Buddhist names, so everybody wanted one after that, and prices went up dramatically,” Mr. Mori said. “Everyone was getting richer, so everyone wanted one. “But that gave us a bad image,” he said, adding that the price of the top name in Akita was about $3,000 — though that was a small fraction of the price in Tokyo. Indeed, that image is reinforced by the way the business of funerals and memorial services is conducted. Fees are not stated and are left to the family’s discretion, and the relatives generally feel an unspoken pressure to be quite generous. Money is handed over in envelopes, and receipts are not given. Temples, with their status as religious organizations, pay no taxes. It was partly to dispel this bad image that Kazuma Hayashi, 41, a Buddhist priest without a temple of his own, said he founded a company, Obohsan.com (obohsan means priest), three years ago in a Tokyo suburb. The company dispatches freelance Buddhist priests to funerals and other services, cutting out funeral homes and other middlemen. Prices, which are at least a third lower than the average, are listed clearly on the company’s Web site. A 10 percent discount is available for members. “We even give out receipts,” Mr. Hayashi said. Mr. Hayashi argued that instead of divorcing Japanese Buddhism further from its spiritual roots, his business attracted more people with its lower prices. The highest-ranking posthumous name went for about $1,500, a rock-bottom price.